Fifty yearsago today, a small satellite -- the world's first built and launched by humans-- rocketed into orbit, beaming down a series of beeps that heralded the comingSpace Age to anyone listening on Earth. The former Soviet Union's successful launch of Sputnik 1, a 23-inch(58-centimeter) wide sphere that resembled a silver beach ball with antennas,on Oct. 4, 1957 marked humanity'sfirst leap into space. Larger andmore sophisticated machines followed Sputnik into space, some with creaturesaboard and others with science instruments, and it was only a matter of timebefore humans catapulted themselves into that high frontier above Earth. With theSoviet Union's successful launch of cosmonaut YuriGagarin on April 12, 1961, which sparked a race with the United States to send astronauts tothe moon and back, humanity firmly established its grasp on spaceflight. ByJuly 20, 1969, the first humans – Apollo 11 astronauts Neil Armstrong andBuzz Aldrin – were on themoon. "Herewe are, for the first time, leaving our planet," former Apollo astronautEdgar Mitchell told SPACE.com. "It's the beginning of a whole newepoch in human civilization." Mitchell wason the winning side of the lunar space race between the U.S. and Soviet Union.He served as lunar module pilot during NASA's Apollo 14 mission – America's thirdmanned moon landing – in 1971. 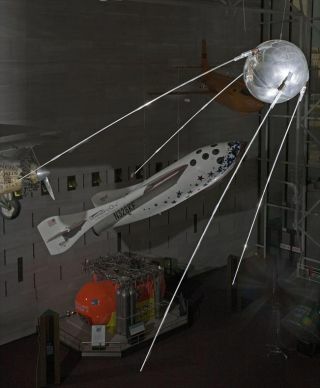 Sputnik'sfirst flight and the advancements that led to Gagarin's launch and NASA'sApollo landings marked a pivotal point for human exploration, one that has ledto a permanent presence for astronauts aboard the ISS, he said. "It'sabout as important as when the Phoenicians first started paddling across theMediterranean and the South Sea islanders first started in their outriggercanoes across the Pacific Ocean," Mitchell said. But humanspace exploration was initially driven by political pride and technologicalprowess, not pure science and wonder, former spaceflyersrecalled. "Whatmotivated us…to go to moon was the advancing nature of the Soviet Union with Sputnik," former Apollo 11astronaut Buzz Aldrin – the second man to walkon the lunar surface – told SPACE.com. The Cold War between thetwo superpowers was well under way by then, he added. Three spaceflyers -- Russian cosmonauts Fyodor Yurchikhin, OlegKotov and U.S.astronaut Clayton -- are living in orbit today aboard the International SpaceStation, though none of them were even born yet the day Sputnik launched. "Ithink it's very important that we work together," Anderson told Russian students this week. "I think the most important thing about the International Space Station isthat we're learning to go farther as a world, and not just as independent countries." NASA isonce more trying to reach out to the moon by retiring its three remaining spaceshuttles in 2010 and reviving the capsule-based spacecraft concept from its Apollo era toferry astronauts back to the lunar surface by 2020. "Wehad the potential, when we got back from the moon in the Apollo days, to startbuilding the technology…to get on with it and go to Mars," Apollo 12lunar module pilot Alan Bean told SPACE.com. "I thought in my lifetime I might see people on Mars; certainly I wouldsee them training and getting ready to go." But, explainedBean, cultures and countries rarely live up to their potential due to theshifting nature of interest, funds and priorities between generations. "I'mnot discouraged by it," Bean said, but stressed that NASA will likely needmore definite funding if it is to succeed in returning astronauts to the moonby 2020, let alone reaching out beyond lunar exploration. Continuedcooperation among different countries, Malenchenko added, will also be vital tothe success of the ISS and future missions to the moon and Mars. On Oct. 10,Malenchenko – who commanded the ISS in the past – will launchtoward the space station aboard a Russian Soyuz spacecraft from BaikonurCosmodrome in Kazakhstan.Riding to space with him will be U.S.astronaut Peggy Whitson – the first female spaceflyer to command the ISS –and Sheikh Muszaphar Shukor, Malaysia’sfirst astronaut. Whitsonand Malenchenko, the space station’s core crew of Expedition 16, willrelieve Yurchikhin and Kotov aboard the orbital laboratory. Anderson will join Expedition 16 for thefirst leg of the mission. Astronautsfrom Europe and Japanare also due to visit or stay aboard the ISS during Expedition 16, and onlythrough such cooperation will research and exploration prosper aboard thestation, Malenchenko said. “Thatwould be the way to go in the future as well,” he added.